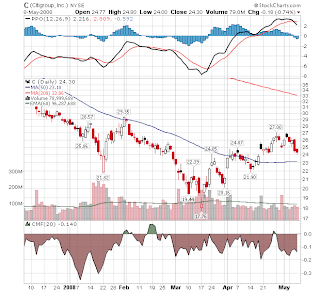 Time to Short Financials again? Financial sector is weakening again this week. 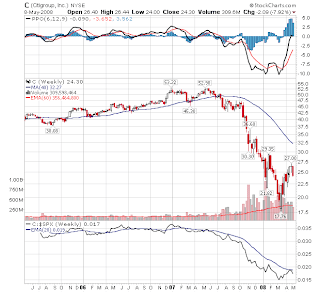 Citigroup Inc (C) is one of the option traders favorite counter. A potential target for put options as the daily MACD is trending down and weekly MACD may not able to cross to the positive zone since the waves of good news have been waning this week. Time to put a bearish stamp on it? The DJIA uptrend is still pretty strong so any trickle of good news may propelled this stock to green territory. Cautious moment for short seller wannabes.